Built by David and Wilson Grisamore in 1837. The Grisamore House was one of the nicest homes in Jeffersonville in the early 19th century. 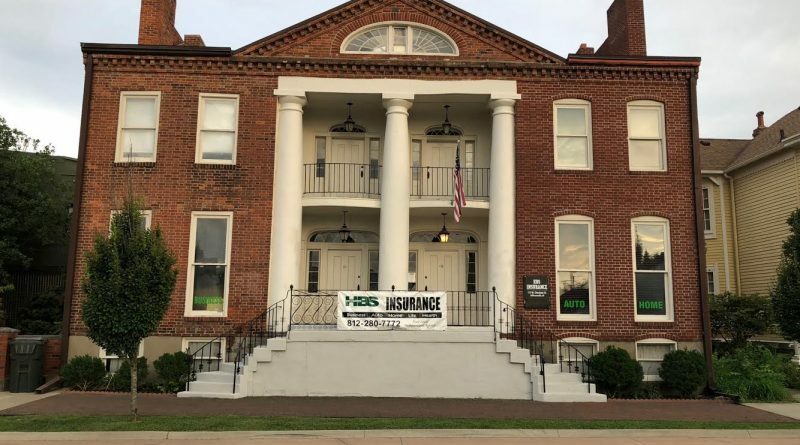 In 1840 William Henry Harrison gave a speech on the front porch of the building as he was campaigning to become the ninth President of the United State in a tight race against incumbent Martin Van Buren. The Grisamore brothers didn’t stay in the home very long. While David stayed around and helped start St. Paul’s Episcopal Church his bother Wilson left Indiana to start a sugar plantation in Louisiana. The home was sold to Indiana Militia Colonel James Keigwin. Keigwin was a controversial figure during the Civil War as he was outspoken about Indiana Governor Oliver Morton. Morton wanted Keigwin to resign and the Colonel agreed. However, Keigwin’s superiors thought to highly of him and would not accept his resignation. In 1862 after accepting a truce with Confederate soldiers at Cumberland Ford rebels unknowingly shot at Keigwin late at night when they saw him riding towards them. Keigwin was not hit by the gunfire but his horse was. When the bullet struck the horse it through the Colonel off severly injuring him. Keigwin was forced to retire and went onto serve as a Indiana state senator. He would live the rest of his life at the Grisamore House drawing his military pension until his death in 1904. After Keigwin’s death the building changed hands several times until prominent physician Lod W. Beckwith bought it. Dr. Beckwith lived in the building and also treated patients there. In 1981 the building caught fire. Part of the right side of the building was destroyed as well the entire roof. Two years later it was restored and added to the National Register of Historic Places. Today the building is home to a local insurance company. Employees in the building have claimed to see the spirit of a man in period clothing. The ghost is believed to be that of Dr. Beckwith. People have smelled strange odors and have heard footsteps in the building at night where no one else was working. With over 60 haunted locations in the Louisville Ghost Map you can take a ghost tour of Jeffersonville and visit the Grisamore House and other haunted places around town for only $1.99.